The ‘meetings’ with 2-4 people, about twice the number of cups of finished cafe lattes on the table and a couple of laptops, that seem rather spontaneous but of course have been carefully planned way in advance. A good meeting venue is centrally located and easy accessible by public transport as you do not want to waste time driving. It is reasonably large with tables and comfy chairs as even though these meetings would not be about the state secrets, you don’t necessarily want to hear about the neighbours’ issues. Spread around the room and well located in relation to the tables there are power sockets for the laptop and perhaps to charge the mobile. The wi-fi is a given and of course it is of the highest quality. Free of charge is a great bonus and will no doubt pay off in coffee sales for the place in question. And yes, the coffee needs to be Italian and add to that some foccacias and paninis and I will be prepared to spend money here all day. As will many others. The number of drinks and sandwiches that you get for the price of a private meeting room is quite substantial! Oh, subject for the meetings? Yes, we are recruiting new Squad Managers so I am in the process of meeting the most amazing people. Highly motivated, inspired and ready to get involved to give of their time. For the chance of being part of England Golf. That is pretty special! The PGA Tour is back at Bay Hill this week. As is customary the leaderboard is full of top class players. I guess many of them live just around the corner from Bay Hill so I am sure it is a good week for them to play. One that don’t, as he live on the West Coast, is Phil Mickelson. Just before he left for Orlando Phil apparently shot 58 around his home course. Not a bad round… Of course that home course is not like Bay Hill, set up to welcome the world’s best for a week, but still it should give some sort of indication to whether Phil is in form or not. It is the classic discussion about if it is at all possible to make predictions in golf. If you run 400m and one day break your personal best then I would think that you very seldom come out a few days after that and run 2 seconds slower. In golf that seems to happen all the time. Henrik Stenson shot 67 the first round at Bay Hill. And then followed up with a 78 to almost miss the cut. Anyone that has ever played competitive golf knows that happens. You have to wonder why it is so difficult to get away from though. Phil Mickelson? Well, with 71-67 he is one shot of the pace going into the weekend! Rhys Davies has won on the European Tour. Even though it might seem like it took the 2005 and 2007 Walker Cup player a little while to accomplish, this is actually a fantastic achievement. It is interesting to have a closer look at Rhys way to become a European Tour Champion. The European Tour biography pages give really good insights on what players have been up to for those of us that are interested. 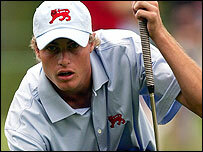 Rhys won the Boys Amateur Championship in 2003 after which he pursued a scholarship at Tennessee State University. At college he won no less than 10 times and his scoring average in 2005/06 was the lowest of all players in college. Overall in college he scored under par 89 times out of the 149 rounds he played and had another 20 top three finishes, to add to his victories. A pretty impressive resume! 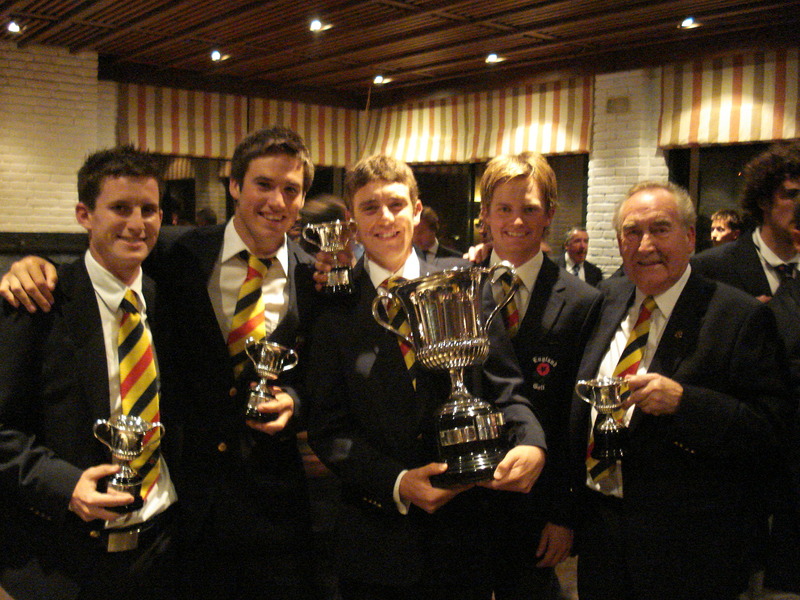 As Rhys turned to the professional game in 2007 it was not until a sponsor’s invitation gained him entry to the Challenge Tour event on home soil that things really started to happen. He won this event and another one in Spain en route to a fourth place finish in the overall Challenge Tour standings. This, thank you very much, gave Rhys the European Tour Card for 2010! We are now in March and after a bit of a rocky start Rhys has posted a 6th in Abu Dhabi and a 3rd in Malaysia on his way to winning in Morocco. This does make you wonder where he had been without that exemption into the SWALEC Wales Challenge in 2009! 23 shots! Not a bad statement to make in the first team event of the year. The England Team of Tommy Fleetwood, Matt Haines, Tom Lewis and Chris Paisley showed no mercy with the other teams and cruised to a start to finish lead and victory. In the individual event the English had to surrender to Italian Nino Bertasio who finished one shot ahead of the nearest contender, Tommy Fleetwood. For full results click here for team and here for individual. England is in a winning position going into the last round of the European Nations Cup at Sotogrande in Spain. With the last round being played today, Saturday, England have secured a bit of a cushion with 18 holes to go, 19 shots ahead of Italy. For full team results click here. ‘Is it even possible to plan for peak performance in golf’? One thing is sure though; many have tried and failed. A number are still more guided by the tournaments that show up on that schedule put together by the European or PGA Tour, or why not by the Amateur authorities, than by their own needs and ideas. Others hope that the more I play the better I get, or even the luckier I get. The interesting thing is that there is enough proof to suggest that all techniques work. Or they don’t work. At least not all the time. And at the end of the day, that is the bottom line. Is there anything that works always??? I am pretty sure there isn’t so in the meantime, perhaps a good idea is to try to find something that works more often than it fails? It would seem that is what the Big Easy has done. At least for now. When I lived in southern Spain in the mid nineties for a couple of years I was as cold as wet as I have ever been during one of the winters. I believe that winter must have broken every record in the book with regards to rainfall in the region. From what I understand, it could be that this winter has seen that record sky-rocket as it seems like nobody has seen as much water on the Costa del Sol as what has fallen from the sky this year. The Spanish Amateur was heavily affected by the rain and I think the tournament director must have tried every trick to somehow be able to crown a champion in the end. No shadow, or rain, should fall on the two English men that battled it out in the final though. In the end it was Matthew Haines who proved to be the strongest of the two when he birdied the first extra hole to capture the trophy from fellow Walker Cup player Tommy Fleetwood. Matt can now look forward to a place in the Spanish Open on the European Tour which the Spanish Golf Federation usually allocate to the winner of the National Championship. For full results from the Spanish Amateur click here.